Last year, The Economist proclaimed the podcast had come of age. It’s never been easier to create, edit, and upload a podcast and an increasing number of academics are using it to showcase and share their research. Christine Garrington explains why podcasting is such a powerful and impactful tool for researchers, and also offers some pointers to those looking to start their own series; from being clear about your objectives and who your podcast is for, to the importance of striking the right tone and eliciting feedback along the way. Being really honest, when I first thought about podcasting, it was as much about me as it was about the research I was looking to promote. 10 years working as a radio journalist meant it was something of a natural fit when it came to things I could potentially do well in my role. 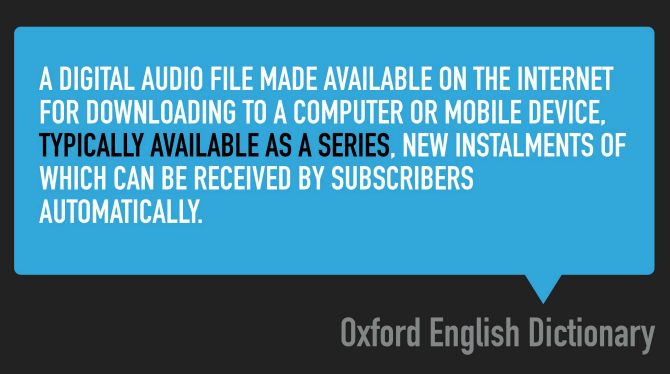 Saying that, it struck me very early on that these audio interviews released over time with a format similar to a mid-morning radio interview were potentially a great way to communicate research and increase its potential for impact. A decade on, I have produced podcasts on the world’s largest longitudinal study and how it’s used to benefit society; a programme of research designed to reduce inequality between men and women; genetic testing for breast cancer; children’s health and development; and the role of evidence in human rights advocacy, the most recent series of which is working to end modern slavery by 2030. I don’t think podcasting can get much more impactful than that! One of the most popular podcasts I produce is all about research methods! Who knew? With 60,000 podcasts available in the iTunes store, podcasting can certainly now claim to be an established part of the media landscape. But what is it about podcasting that works so well when it comes to sharing research and showcasing and achieving impact? The most recent RAJAR report, which analyses audio listening in the UK, sheds some light on this, explaining that podcasts “skew to wanting to be connected to a community of like-minded people, […] the need to learn something new”. The report points to the convenience of podcasts, allowing people to listen to whatever they want wherever and whenever they want. It also tells us that people who listen to podcasts do so for an impressive 6.1 hours a week. They are loyal too, with 62 per cent saying they listen to all or most of their downloads. The RAJAR report also notes that people who commute, exercise, struggle to sleep but need some relief from the blue-white fuzz of a computer or smart phone still require stimulation, concluding that “podcasts fit our lives in a way that virtual reality headsets may never. They liberate our eyes”. There’s something quite personal and intimate in hearing a researcher talk about their work, especially in a conversational setting rather than in a presenting situation – it can help bring complex ideas and issues to life. As long as a researcher can talk confidently and accessibly about their research, adding context and comment where they can, this can really help non-academic audiences get to grips with those ideas and see how they relate to them. Audience research figures in the US estimate that 112 million people have listened to a podcast at least once. 67 million are listening to podcasts every month; 42 million do so every week. Those listening on a weekly basis listen, on average, to five different podcasts. Discussion about whether podcasts can start to take hold in countries such as India, where there is little or no culture of listening to talk radio, is also beginning to emerge. Podcasting apps have made it easier than ever to subscribe, download, and listen to a podcast of choice. Specialist podcast hosts such as Libsyn, Spreaker, and Stitcher make the process of creating and sharing your show much easier. They also provide metrics so you can see how many downloads you are getting and which episodes are most popular. 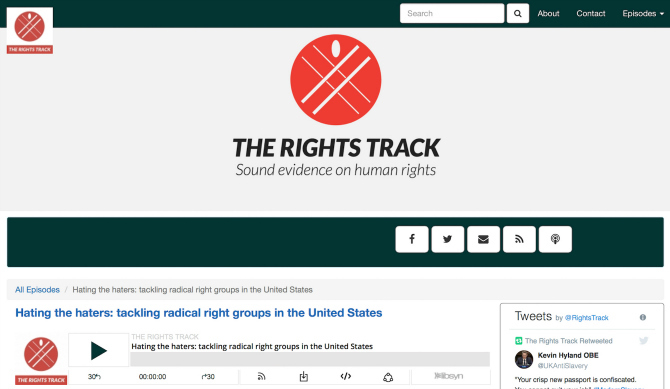 The Rights Track podcast is hosted by podcast specialists Libsyn. So what key lessons have I learned after a decade of podcasting with social scientists? Just as you would think about potential beneficiaries in a grant bid, think about who is going to benefit from your podcast. Set up a Facebook group and Twitter account not just to share but to engage – get ideas and feedback. Consider the format and aims of your podcast before you switch the microphone on. For example, the human rights podcast I produce has a clear aim “to get the hard facts about the human rights challenges facing us today”. Think about tone and style – will your podcast feature hard-hitting interviews, fireside chat, edgy conversations, or quirky commentary? Let each episode tell a story that has a beginning, a middle, and an end. Think in terms of series – say, one episode a month for 12 months for Series One. Invite and consider feedback from listeners along the way and ask yourself what worked and what didn’t. Newsjack – is the topic of your podcast in the news today? Join in the conversation and point to episodes of your podcast that might be of interest. Get some professional training or support – write this into your grant bid; there are lots of great courses. There has never been a better or more exciting time to be podcasting and to be using podcasts not just to share research findings but to really engage with people interested in getting the hard facts about the many challenges facing the world today. But what’s more important is getting the subject matter, aims and format of your podcast right in the first place, and you do that best by thinking about and engaging with your audience from the outset. One thing I have learned in ten years of podcasting is that podcasts are more about communities engaging than being a simple a vehicle or tool for communication. Viewed that way, podcasts have the potential to put you right on that pathway to impact. Featured image credit: SM7 vs The Flea by Neil Godding, via Unsplash (licensed under a CC0 1.0 license). Christine Garrington is a freelance consultant with extensive experience collaborating with social science researchers to maximise the impact of their work. She co-edits a number of research focused blogs and specialises in the production of podcasts for research centres and individuals around the UK and in the States. She also manages a number of social media accounts for research projects/blogs and produces compelling print and digital content for researchers and centres that clearly demonstrates actual and potential benefits to research users. Don’t forget when you make a podcast to learn some basic sound engineering. It’s really easy to filter out unnecessary bass and treble. And I’m sorry to say but many LSE lectures are very quiet, a little limiting will sort that. These two things take a couple of minutes but make the experience for the listener so much better.